Here's a fun DIY for all you music lovers out there. This will also add a vintage look to your Christmas tree. First, tea stain sheets of music to give it an old look. Boil water, turn off the burner, add one tea bag. Take a few sheets of music. Place the sheet music in the tea. It may rip a bit. Lay the wet sheet music on a baking pan and place it in the oven at 350 for no more than 3 minutes to dry it. You can also hang it out to air dry if this is a bit scary to you. 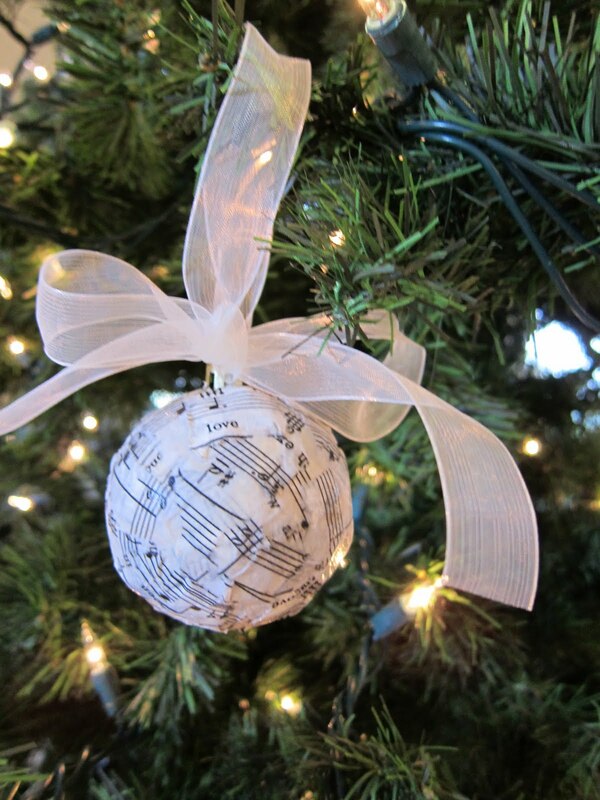 Tear the sheet music into small strips and have ready an inexpensive dollar store ornament. Decoupage the sheet music onto the bulb. Let it air dry and add some ribbon or tulle at the top to hang on the tree. Do you make your own decoupage glue? If so how?